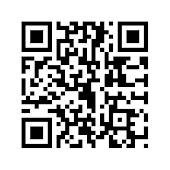 I first apologize that this might get lengthy because of quotes. Please bear with me because this might be one of the most important legal arguments this country faces today. 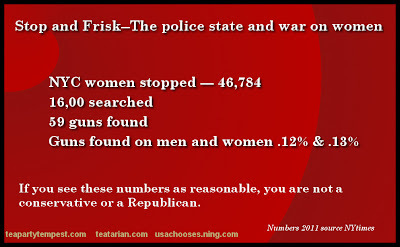 New York city has a law named Stop and Frisk. It seems this law allows police to randomly stop people with only a reasonable suspicion and frisk the surface of the person. 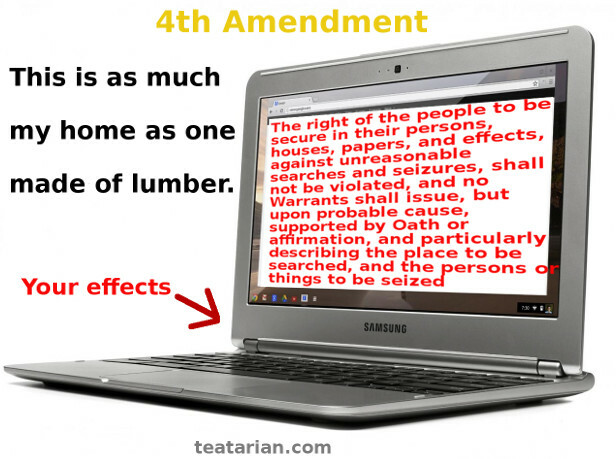 Many of us believe this law comes into conflict with the 4th Amendment, which states that police must have probable cause to search Americans without a warrant and protects against unreasonable searches. I guess the first thing we must do is understand the difference between the two words. 1. agreeable to reason or sound judgment; logical: a reasonable choice for chairman. 2.not exceeding the limit prescribed by reason; not excessive: reasonable terms. 3.moderate, especially in price; not expensive: The coat was reasonable but not cheap. 5.capable of rational behavior, decision, etc. 2.having more evidence for than against, or evidence that inclines the mind to belief but leaves some room for doubt. 1.not reasonable or rational; acting at variance with or contrary to reason; not guided by reason or sound judgment; irrational: an unreasonable person. 2.not in accordance with practical realities, as attitude or behavior; inappropriate: His Bohemianism was an unreasonable way of life for one so rich. 3.excessive, immoderate, or exorbitant; unconscionable: an unreasonable price; unreasonable demands. 4.not having the faculty of reason. The basis of the Stop and Frisk law stems from an incident in Ohio that eventually led to a 1968 Supreme Court decision. In short, a police detective saw John Terry and another guy standing in front of a store. The men appeared to be casing the store for a potential robbery. These men were approached by the detective and frisked. John Terry was arrested on a gun charge. stop and frisk n. a law enforcement officer's search for a weapon confined to a suspect's outer clothing when either a bulge in the clothing or the outline of the weapon is visible. The search is commonly called a "pat down," and any further search requires either a search warrant or "probable cause" to believe the suspect will commit or has committed a crime (including carrying a concealed weapon, which itself is a crime). The limited right to "stop and frisk" is intended to halt the practice of random searches of people in hopes of finding evidence of criminal activity or merely for purposes of intimidation, particularly of minorities. I dare say the detective was correct and these men were likely up to no good. In this case the detective might have had probable cause and was not unreasonable in their pat-down of the men that led to finding the weapon. What has puzzled me is if an officer operates within the 4th Amendment, why do you need a specialized Stop and Frisk law? Some don't like the law because they say it targets minorities and there is some evidence that can support that belief. The police are also targeting high crime areas, which is largely minority. Let's not concentrate on the racial aspects, but what makes this law so different from normal police operating procedures? In NYC they say they are doing these random searches to remove guns from the street. If this is the case we must look at another SCOTUS decision. The Court somewhat retreated from their John Terry decision in Florida v. J. L. (U.S. 2000), in which it ruled that an anonymous tip identifying a person who is carrying a gun is not, without more reason, sufficient to justify a police officer's stop and frisk of that person. The U.S. Supreme Court concluded that the tip, stating that a young black male was standing at a particular bus stop, wearing a plaid shirt, and carrying a gun, lacked sufficient reliability to provide reasonable suspicion to make a Terry stop. It would appear that if we leave these decisions to a policeman's reasonable belief, we are opening ourselves up to severe infringement of the 4th Amendment. For that reason we must look at the entire Amendment and not a few words. 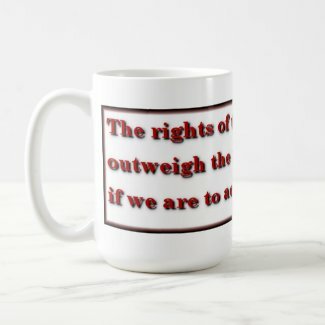 It states that the right of the people to be secure in their persons, houses, papers, and effects, against unreasonable searches and seizures. We know that the police must be careful when entering a house. They usually are very sure there is an ongoing crime, or they ask for permission to enter the home. If permissions is denied they might seek a warrant. Our persons should garner the same respect under the law as our home. SCOTUS rules that a simple pat down, such as the ones by the TSA in airports is not a search. I beg the difference and the difference between a TSA pat-down and one by a police officer on the street is permission. By knowing we could possibly be patted down while boarding a plane, we give implied permission. The same applies if you knowingly go into an event that has a security line. Merely walking down the street offers no implied consent. When self proclaimed conservatives and libertarians argue Stop and Frisk makes the city safer, they have just crossed over to the left where police states lie. The Constitution doesn't guarantee safety—only liberty. Here is the statistic I have been looking for. I had heard that only about 6% of the stops resulted in guns being found. This tells me the searches weren't reasonable under the concept of the 4th Amendment. I would say that the stops and guns found should average above 50% for the majority of the searches to be reasonable. (NY times)The most obvious reason is the brute numbers. For every 100 individuals stopped and frisked, only about 6 are arrested, often for minor offenses like marijuana possession. 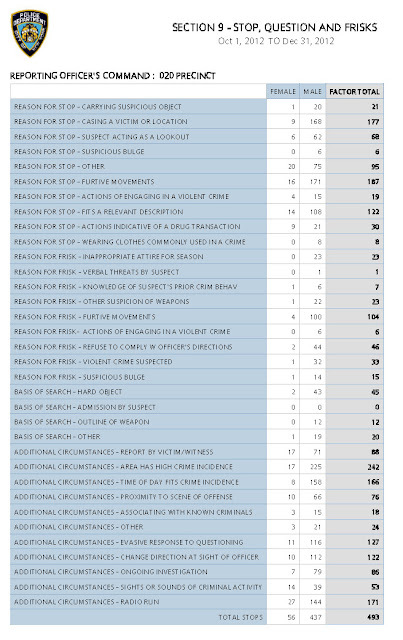 The success rate for finding a gun borders on the nonexistent: 1 in every 1,000 stops. In fact, purely random stops have produced better results. Since when do males officers have the right to feel up random women on the street? 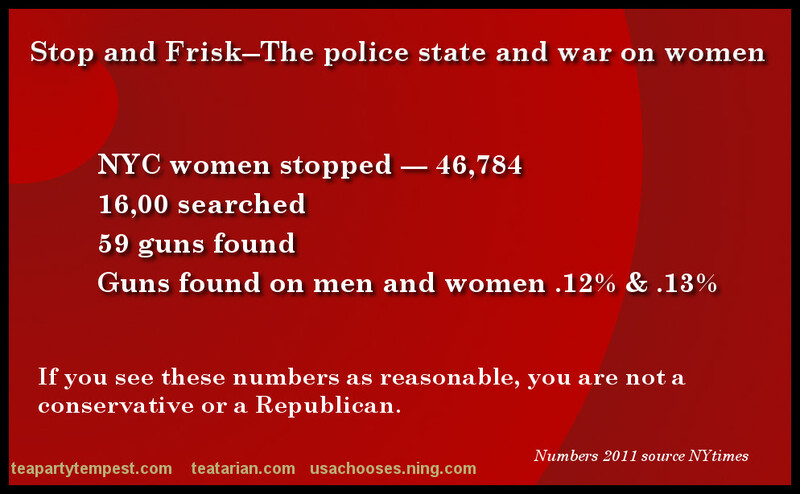 Last year, New York City police officers stopped 46,784 women, frisking nearly 16,000. Guns were found in 59 cases, according to an analysis of police statistics by The New York Times. While the number of women stopped by officers in 2011 represented 6.9 percent of all police stops, the rate of guns found on both men and women was equally low, 0.12 percent and 0.13 percent, respectively. Civil rights leaders have argued that the low gun-recovery rates are a strong indication that the bulk of stop-and-frisk encounters are legally unjustified. Now that you have been presented with all the facts, how do you feel about such laws and searches? Watch for updates to this article.